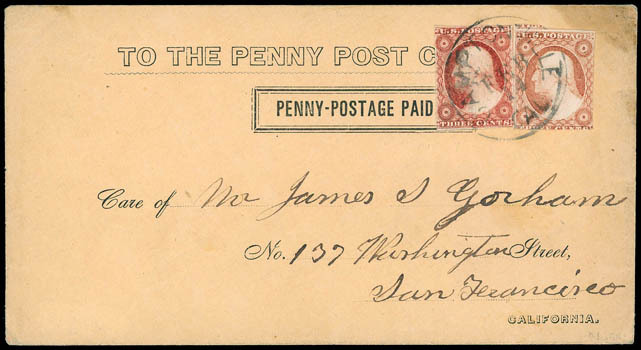 California Penny Post Co., 1855-59, 7¢ black, impressed on U.S. 3¢ envelope (No. U9), and company ad on backflap listing nine offices, addressed to Grass Valley (one of the nine offices), manuscript canceled with "Forest City, Cal., Jany 19" cds (SIE-550, R5) with manuscript date, trivial cover edge wear, Very Fine and choice, an extremely rare California Penny Post usage from Forest City in Sierra County. 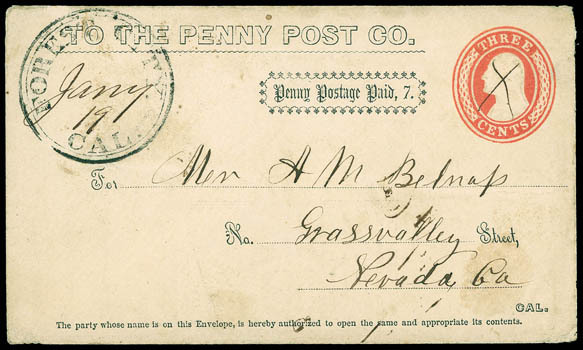 ONE OF FOUR EXAMPLES OF THE PENNY POST 7¢ ORNATE BOXED FRANK ON A NESBITT WHITE ENVELOPE AND UNIQUE TO THE GRASS VALLEY OFFICE FOR DISTRIBUTION. California Penny Post Co., 1855-59, 7¢ black on buff, fresh envelope addressed to San Francisco, franked with 1851, 3¢ dull red, two singles (different shades) for double rate, tied by "Camptonville, Cal., Feb 14" cds (YUB-260, R4), reverse with docketing "Recd 16th at 12½P.M. 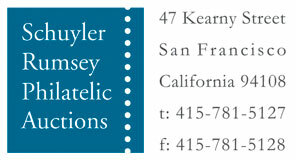 "; small light corner stamp at top right, Very Fine. Scott No. 34LU11+11 Estimate $4,000 - 6,000. THE ONLY KNOWN DOUBLE RATE EXAMPLE OF THE PENNY POST 7¢ PLAIN BOXED FRANK ON BUFF ENVELOPE - ONLY EIGHT USAGES OF THIS FRANK RECORDED.